Hi there everyone! Today we are celebrating the new "Sending Sunshine" release by Simon Says Stamp with a blog hop and I'm so excited to have you here! Make sure to read till the end because there is a giveaway and a little surprise ;). ¡Hola a todos! 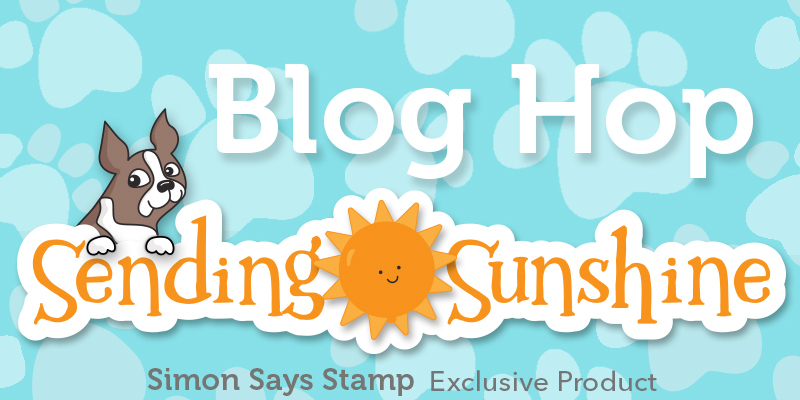 Hoy estamos celebrando el lanzamiento de la nueva colección de Simon Says Stamp "Sending Sunshine" con este blog hop y ¡estoy encantada de tenerte por aquí! Asegúrate de leer hasta el final porque hay un sorteo y una pequeña sorpresa ;). Sometimes it's difficult to choose what to use among so many wonderful products, but the moment I saw the "Flower Cluster" I knew I had to play with it first! I love how detailed it is, just beautiful. Algunas veces es difícil elegir un producto entre tantas maravillas, pero en cuanto vi el troquel "Flower Cluster" supe que tenía que usarlo primero, ¡es precioso! To make my card I simply inked a three pieces of cardstock with Distress Oxide Inks, die cut all the pieces and arranged them together. That simple! But please for more details watch the video below or at my Youtube channel ;). Para hacer esta tarjeta he coloreado tres trozos de cartulina con tintas Distress Oxide, he troquelado todas las piezas y las he pegado en un panel gris. ¡Así de simple! Para más detalles podéis ver el vídeo aquí abajo o en mi canal de Youtube ;). If you want more inspiration with the new release, check my previous post here! Si queréis un poquito más de inspiración con la nueva colección podéis ver mi entrada anterior aquí. This post is part of a blog hop celebrating Simon's newest release and of course there is a giveaway! Simon is giving away a $25 gift card to a lucky winner at each stop on the hop! You just have to leave a comment, so make sure you visit every stop for more chances to win! The winners will be announced on Simon's Blog next Wednesday. Esta entrad es parte de un blog hop para celebrar el último lanzamiento de Simon Says Stamp ¡y también hay un sorteo! Simon regala un certificado de 25$ para su tienda a un afortunado o afortunada en cada uno de los blogs que participan. Solo tienes que dejar un comentario, así que asegúrate de pasar por todos los blogs para tener más oportunidades. Los ganadores se anunciarán en el blog de Simon Says Stamp el próximo miércoles. Además tenemos una promoción especial solo para ti! 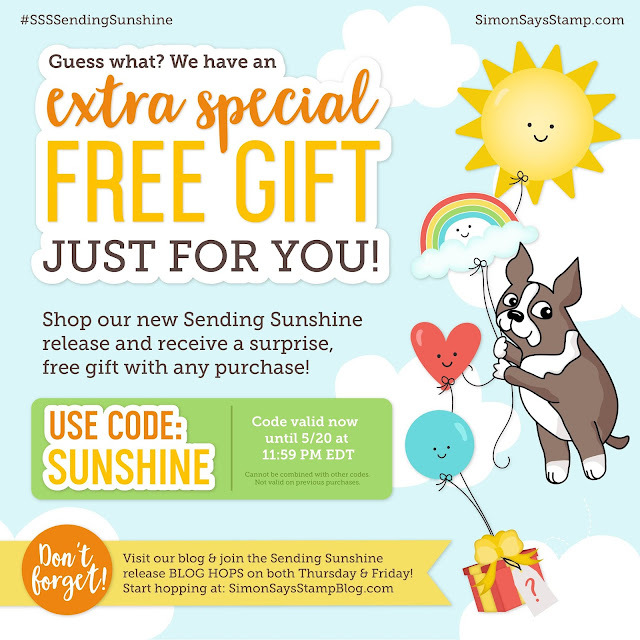 Usa el código SUNSHINE para recibir un regalo sorpresa con tu pedido (válido hasta el día 20 de mayo a las 11:59pm EST). Time to hop! Your next stop is the talented Nina-Marie Trapani! Y ahora ¡a saltar! La próxima parada es el blog de Nina-Marie Trapani. Amanda Korotkova - you are here! absolutely beautiful colors and love how you framed it around the center! SO stunning! Your colours are so so pretty! I really like the white drops. They add such pretty details. Beautiful summer colors on your cards! Beautiful card! Love the color combo and the delicate flower die. Beautiful card! Thank you for sharing with us! Beautiful card, love this color combo - it’s so soft and pretty and perfect for these delicate floral die cuts. I also like the soft colors on Bristol paper, thanks for sharing the difference between that and Neenah solar white. I love these soft colors and the flower cluster die is beautiful. I love the softer colors, this is gorgeous! These cards are wonderful. I particularly like the white die cuts on the peach/pink background. Love the elegant simplicity of the card. and delicate. Both of your cards are so lovely. Wow! Awesome cards!!! Love so much the beautiful colors!!! Wow! This is gorgeous! That big block Summertime text looks so pretty in those vivid pastels and background! Looks beautiful! Love your use of the floral die on both cards. Such sweet colors you used for your cards! Love them both! So pretty and the die looks so different than how Cathy Z used it!! Love the softness of your cards! Summer cards yey! Great choice of colors! Love it! I LOVE these cards! So many cute ideas from this hop! I love the colors you used on the card; very summer-like! Love the look of the Distressed Oxides! I LOVE the colors you use. They are always so soft and lends a beautiful background for your cards! Love these cards. Great soft tones. Beautiful card and I love the bright spring colors you used. So pretty with these due cuts. Great job. Really like that color combo. Very colorful cards. Beautiful cards. I love the blending! Your cards are so delicate and pretty! Beautiful cards. I love the way you used the Flower Cluster die. And the colors are gorgeous. absolutely beautiful colors, love how you allways make simple but beatifull cards. Love it! Me too. I loved the flower cluster at first sight. Thank you for a great design. Beautiful summer colors! Love it. The colors are so soft and beautiful, like a warm summer breeze! Both cards so pretty!! Really enjoy seeing them Amanda. Such a pretty card! Love everything about it. I love all your projects. And this one is one of them. Thanks for inspiration and for this opportunity. Love your choice of changing out the letters, the white made it pop! Both of your cards are gorgeous Amanda. Your work is always so beautifully done and very inspiring. This is an awesome release as SSS is known for...L♥VE IT! Absolutely love the choice of colors! What a beautiful soft card! I love this die! This is such a gorgeous card - already I can see how versatile this die would be. Love it!! such cheery and pretty cards both- but my fave is summertime-my favorite season of the year! Gorgeous colors and love how you framed it around the center! Both cards are lovely!! I love the colors you used. Really pretty cards. I love your cards and the colors remind me of the tropical fruit flavor popsicles we eat all summer! Beautiful colors and designs, love it. I love the cards you made, the white enamel dots really added the pop, and you didn't make a mess! I see this as a die I need to add to my collection thanks to your video. Great ideas! The Oxide is so pretty blended on the die cuts. So elegant and so stunningly beautiful!! Very pretty! I love the white flowers and the Thank you with the colored background. Love the chipboard letter inlay! I love the color combination! I noticed you added another blue distressed oxide under the wilted violet. What color was that? This is a very pretty card - you make it look so easy! What a beautiful card. Thank you. Amanda, I really like your style. Your cards are really beautiful and will try your examples when my new die arrives. Thanks for the inspiration. Your cards are beautiful ! I love the colors you've selected and how you've used them. I love your card designs, so soft and pretty. The video made it easy to follow. Love your work. Thanks for sharing. Your color combinations are so pretty! Love the card designs, as well! These are gorgeous. I love how you used the die. Oh, I love the soft colors you used on the first card. These are the colors you see so much in swimsuits, sundresses, and of course, flowers in the spring and summer. They are so pretty and just make a person feel happy to look at them. The second card is more monochromatic but also very beautiful!! Thanks for sharing a lovely card! Wow I adore the colours on the first ...it reminds me of the summer sunsets. Beautiful cards! the second one is my favorite, I like the way the white die cut pops on the blended background. I love the color combo on your first card, but my fav is your ombre thank you card. Its so soft and pretty. Just stunning!!! Absolutely beautiful (as always)! I must have that intricate flower die! Both cards are beautiful. I really love the color choices for each. Thanks for the tip about the types of paper! Oh I love your cards!! The soft colors really speak to me!! Great job! Love the colors you used on these cards! Beautiful card! Perfect for summer! Very pretty card! Love the inlay technique. Pretty cards! Loved your color palettes on both of them. Pretty dies & colors used. Love the inks that you used!! Beautiful colors, beautiful cards. Thank you. Beautiful card! The ink blending is gorgeous and the colors are perfect for summer! These are beautiful new dies. Love your creationd. Beautiful cards. I love the colors you chose on both cards. Beautiful card! Love the soft colors, reminds me a bit of sherbet - light and summery. That floral die cut is so lovely on your cards. What beautiful cards. I absolutely love the color blending that you achieve - it is so soft and seamless. Both cards are gorgeous with a great colorcombo. Thanks for sharing and the chance to win. Your cards are just amazing! I love the color combinations you have used and the die selections! Thanks for sharing the inspiration. Beautiful Amanda. This is an awesome release from SSS. Thank you for sharing your beautiful cards. Great color choice for this beautiful card. Wow love your pastels so pretty. Love this new release from SSS. Pretty cards. Love the colors you chose for the first one. Very very pretty cards, so inspirational. Thanks so much. Love that summertime text die. !! On my wish list. Looks great how you incorporated it. Both of your cards are so pretty! I especially like the pink ombre background with all-white die cuts on the second card... very refreshing. TFS your talent and inspiration. Love the colors, really love both of your cards. I love the shading of the colors. I think the first is my favorite. Two beautiful cards! Love the soft pastel colors, like a light summer breeze! Beautiful! Love the colors you put together and blended! i'm having a great time getting inspired with my very first blog hop!!! what fun!! Beautiful cards. Love your use of the die. Pretty card. Love that die. What a lovely card. I really like how you put it on the grey cardstock so that the white letters and Nuvo drops could pop like that. And your favorite color combo remains a winner! It looks like a very inviting sunrise. Thanks for sharing with us! Love these. They are so impressive. I would love to receive any of these cards. Great job. Wow! Those colors make you almost want to eat the card! Super pretty...I like the colors you used on both!! That flower cluster die is so gorgeous! Thanks for sharing! Love your card idea! Thank you for sharing! Very nice card. I love the idea and the color suggestions. I'm just getting into distress inks so I look forward to trying. LOVE the cards and thinks for the videos! I'll have to try out those colors. Preciosa tarjeta. Los colores son muy lindos. A very nice use of dies plus inks. The colours are my favorites. Love your cards! The soft colors are so pretty! Gorgeous colors.... How did you do it? Love the blends! so pretty. Love the ink blending, gives the final product so much wow!! Both cards are beautiful! I love the color combination in the distress oxides. Also the white dots really finishes the die cut! Very pretty! Several of you have been using light gray as background, I will have to try that. Beautiful cards, Amanda! The color combination is wonderful! Gorgeous cards - the colour choices are great. They make me think of a cool, fresh, sweet, fruity sorbet! Perfect for summer! Super love the summer time card!! One of my new favs! Celebrating summer! Who knew it was so pretty!! I love both cards! The colors you chose to use with the Flower Cluster die are perfect for summer! Good job! It made me wish I had that die right now so that I could go downstairs and make similar cards. What beauties! Love the colors and that lovely flower cluster! Ohhh I love the crystal raindrops the most! Thanks for sharing. Send me some sunshine please...Beautiful cards! The flower cluster die is one of my faves from this release. Your cards are lovely! Your go-to colors are so pretty together. That flower die-cut is really fun. Wow!!!! Really Beautiful cards!!! I love this flower cluster die!!! Your cards are absolutely beautiful. I love the Summer Time card and the colors, however the second card is awesome also. Thanks for sharing. Beautiful choice of colors. I really like the flower clusters die as well, it's so cute and elegant! Very pretty card and I love the colors! I love your blog and the new cards! Thanks for all the fun ideas and inspiration. I love your color combination; it shouts, "SUMMER". A lovely compliment to the pretty flower die. Thanks for sharing both of your lovely cards. The color on your die cuts are pretty. White enamel dots give a remarkable finish! The gray background was a subtle touch for the color scheme. I like your style. Hope you will allow a C.A.S. When I get my die I am making one for a special lady. your design definitely feels like summer!! Love those color combos! Beautiful cards!